OCEAN BEAUTY (1977) The 44 foot oil screw fishing vessel Ocean Beauty sank May 6, 1977 south of Marmot Island. OCEAN BEAUTY (1996) The 30 foot fishing vessel Ocean Beauty grounded and was lost August 25, 1996 at Port Moller. Both crewmembers found their way to safety. There was not expected to be salvaged. OCEAN BOUNTY (1985) The 90 foot crab fishing vessel Ocean Bounty flooded her engine room and sank March 21, 1985 approximately 110 miles south of Cape Saint Elias. Winds were at 65 knots and seas 35 feet when the disaster occurred. The three persons aboard were rescued by a U S Coast Guard helicopter. The same vessel had lost a crewmember overboard two weeks earlier. OCEAN CAPE (1979) The 80 foot crab fishing vessel Ocean Cape foundered January 1, 1979 approximately 22 miles out of Cape Fairweather. The vessel was on her way to Yakutat with a load of snow crab. The four survivors were picked up from their life raft by the Crowley Maritime Tug Stalwart after drifting four days with no food and little water. The four men in the raft heard the engines of the tug through the dark night and inclement weather early the morning of January 5th and fired off flares. They were drifting 45 miles south of Yakutat in an area not often traveled by offshore vessels. One of the crewmen on the Stalwart spotted a flare through the 25 knot winds and 8 foot seas. Responding was very difficult as the tug was towing two 400 foot barges loaded with railroad cars destined for Whittier. A dangerous rescue was attempted with success and the four men of the Ocean Cape were taken aboard the Stalwart to Whittier. There was no distress signal issued by the Ocean Cape when she sank 20 miles off of Cape Fairweather. The crew was preparing to set out crab pots when the vessel began listing heavily and sank before they could get out a Mayday. Rescued from the liferaft were Captain Steve Drage of Yakutat, John Burnett of Yakutat, Ely Hanlow of Seattle and Lewis McGlashon of Seattle. OCEAN CASTLE (1971) The Seattle fishing vessel Ocean Castle foundered February 22, 1971 near the Barren Islands after a collision with the tanker Hawaiian Standard. The four crewmen aboard the Ocean Castle were picked up by the tanker and then transferred to the Coast Guard Cutter Storis. Surviving to tell the story were Michael Johnson, Ron Cooper, Gary Mayhew and David Hunt. OCEAN CHALLENGER (2006) The 50 foot fishing vessel Ocean Challenger capsized in severe weather October 18, 2006 approximately 60 miles south of Sand Point. She had been engaged in black cod fishing and was leaving fishing grounds because of incoming weather. Three of her four crewmembers were lost including captain David R “Cowboy” Hasselquist (51) of Hoonah, Steve Esparza (26) of Kodiak and Walter Foster (26) of Westport WA. Kevin Ferrell (28) of Lynchburg VA was the sole survivor. It was reported that the vessels engines had stalled before she capsized. The 592 foot Panamanian Cargo ship Overseas Joyce was in the vicinity and witnessed the Ocean Challenger capsizing. Hurricane force winds and 30 foot seas were reported at the time of the disaster. Ferrell was rescued by a Coast Guard Helicopter who responded to the distress call. OCEAN DYNASTY (1988) The 124 foot trawler Ocean Dynasty sank November 20, 1988 in the Bering Sea. All seven crewmembers were rescued by the processor Golden Alaska. OCEAN HOPE II (1989) The 108 foot long line halibut fishing vessel Ocean Hope II disappeared with all hands March 3, 1989 in heavy weather in the Shelikof Strait. The vessel was last heard from the night of March 2nd and was seeking shelter in Portage Bay. Only a life ring was found days later. Lost were skipper Jack White (33) of Kodiak, Dennis Frye (26), Dan Tullar (26) of Kodiak and Michael Wheeler (27) of Anacortes WA. OCEAN PRIDE (1979) The fishing vessel Ocean Pride sank November 24, 1979 in the Bering Sea. OCEAN QUEEN (1964) The 13 ton 39 foot wooden gas screw fishing vessel Ocean Queen was reported lost at Kodiak in the Good Friday earthquake of March 27, 1964. OCEAN SPRAY (1994) The 81 foot steel trawler Ocean Spray flooded from the stern and sank September 30, 1994 in 50 fathoms of water approximately 35 nautical miles north of Unimak Island in the Bering Sea. Her four crewmembers abandoned ship in survival suits to a liferaft with their EPIRB activated. They were rescued by U S Coast Guard CG-H60 Helicopter and transported to Cold Bay. OCEAN VENTURE (1982) The 82 foot wooden crab fishing vessel Ocean Venture was blown onto the rocks and lost near Nunavachak Bay southeast of Togiak during a severe storm May 25, 1982. At least four other vessels were reported washed onto the shore during the same storm. The Ocean Venture lost power in 90 mile an hour winds and was blown high onto the rocky beach. The crew of the crabber was rescued by a Good Samaritan vessel before piling onto the rocks. OCEANUS (1989) The 52 foot wooden longline fishing vessel Oceanus sank in heavy weather during a halibut opening May 14, 1989 at the entrance to Aialik Bay. All five crewmembers were rescued. ODIAK (1907) The gas launch Odiak was wrecked at Bear Cape in Prince William Sound in 1907. The vessel was valued at $3,000 with cargo at the time of the loss. ODUNA (1965) The 7,252 ton 422 foot steel steam ship Oduna stranded and was lost November 26, 1965 at Cape Pankof. The vessel stranded in heavy seas on the east side of Unimak Island. The radar aboard the Oduna was inoperative and strong currents drug her onto the rocks. The Chief Mate was at the helm when the disaster occurred and was blamed for the stranding. The crew was removed by breeches buoy and helicopter to the Cutter Storis and tug Adeline Foss. Initially her cargo was thought to be lost, but several men organized a salvage effort and were able to save much of what was onboard, including 200,000 pounds of frozen crab in refrigerated container vans. The Oduna was owned by the Alaska Steamship Company. The three crewmen aboard made it to safety, but the Olaf, valued at $2,800, was a total loss. Her cargo of salmon was also lost. She was carrying approximately 35,000 pounds of fresh salmon worth $803.07. There was no insurance on the Olaf or her cargo. The steamer Saratoga was wrecked March 20, 1908 at Busby Island, just northwest of Bligh Island in the Valdez Arm of Prince William Sound. The Olga was valued at $500 at the time of the tragedy and had no insurance. She had been leased by a salvage company for salvaging the steamer Saratoga. The strong southeasterly wind blew the Olga across Valdez Arm to the west side above Point Freemantle. OLGA N (1949) The 11 ton wooden gas screw Olga N foundered in the Gulf of Alaska May 8, 1949. The Olive, valued at $15,000 was reported a total loss. The crewmen all survived and the Olive was subsequently salvaged. The two crewmen aboard were able to make it to safety but the Olive, valued at $15,000 was a total loss. She was insured for $10,000. OLIVIA H (1941) The 51 ton 58 foot wooden oil screw Olivia H foundered at Dayville December 17, 1941. The Olympia was built in Glasgow, Scotland in 1883 as the Dunbar Castle. She was purchased by the Alaska Steamship Company in 1904 and renamed Olympia. At the time of the disaster she was valued at $165,000. The Olympia and her cargo were both total losses. She was insured for $157,000. Her bottom was badly torn and salvage was not attempted. She sat visible and upright on the rocks as a local landmark until February of 1922. Comment: This is the same reef the Exxon Valdez struck in 1989 causing the worst oil spill in Alaska history. Salvage operations in 1914 by Tacoma diver Walter McCray recovered 14 tons of bronze, a tail shaft, anchors and chains from the Olympia and 64 tons of copper ore from the Saratoga wreck nearby. OMA BELLE (1964) The 11 ton 34 foot wooden oil screw fishing vessel Oma Belle was destroyed by a tidal wave March 27, 1964 at Cordova. 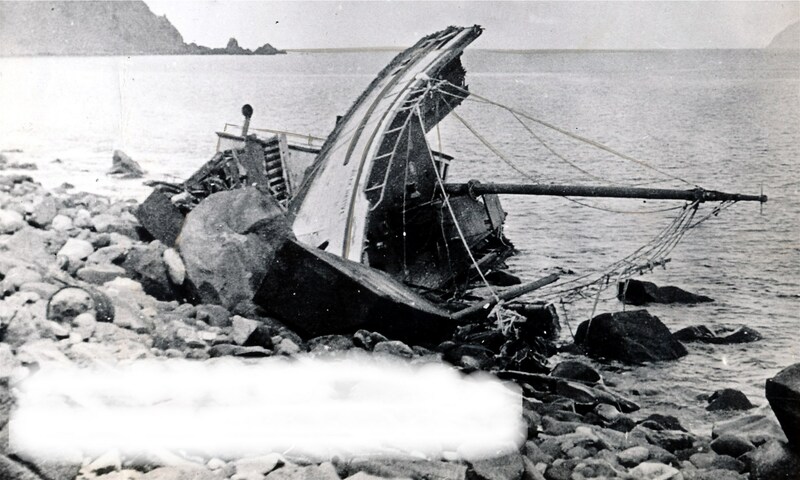 OMANEY (1930) The halibut schooner Omaney stranded and was lost on Sitkinak Island in the Trinity Islands in April of 1930. OMEGA (2005) The 19 foot inboard fiberglass Omega brand vessel burned June 25, 2005 two miles off of the Homer Spit. Three adults and two children were rescued by a Good Samaritan vessel and transferred to a U S Coast Guard Auxiliary SAFE boat. ON TIME (1920) The 27 ton 56 foot gas screw freight vessel On Time stranded and was lost in 1920 in Cook Inlet. The loss was not reported until 1928. The vessel was carrying 550 tons of merchandise and provisions worth $50,000. The Oneida, valued at $15,000 and her cargo were total losses. The vessel was insured for $42,000 and her cargo for $15,000. Wreckage from the vessel washed up on area beaches for days. Combing through the debris, a seal hunter named Irwin found two zinc lined boxes containing $400 in Mexican money and 130 cases of opium. Fights over the loot ensued, but the drugs were eventually sold to Chinamen on Sanak for $4 a pound and the money split with a fellow sailor. ONWARD (1916) The 13 ton 42 foot gas screw towing vessel Onward foundered in September of 1916 at Sheep Creek. No one was aboard at the time of the loss. ONWARD HO (1916) The 323 ton 143 foot Canadian halibut steam trawler Onward Ho was lost off of Cape Fairweather January 18, 1916 with all hands. The vessel had departed Vancouver, British Columbia January 6, 1916 with 34 crewmen aboard. The Onward Ho was leaving the fishing grounds near Cape Spencer when she was caught in a gale. She was sighted by the schooner Alaska and steamer Manhattan carrying a load of ice on deck and in her rigging. When sighted the Onward Ho was “covered with ice, down by the head and making way slowly”. The schooner New England was caught in the same storm and almost foundered because of the heavy icing. She spotted the Onward Ho “in a sinking condition” but was unable to aid because of her own dire condition. Temperatures were below zero. She was never seen again. It is presumed the Onward Ho became top heavy, rolled over and sank. Lost were Captain Fred Fredericksen, Mate H Hughes, Pilot Sid Ulstein, Chief Engineer Thomas Shiminin, Fireman Matthew Walker, Cook Jens Bendicksen Aas, and the following fishermen: P Andersen, H Aune, P Beck, B Benson, R Brandal, C Bravak, D Brown, E Edmunsen, O Hessen, J Knudsen, K Knudsen, H Larvik, O Longfelt, George Mackie, J March, O Olson, J S Petersen, H Rudd, B Schjie, S Simonsen, W Snow, M Stronstad, S Swanson, H Ulstein and H Westvik. The trawler also carried 12 dories and had a large catch of halibut aboard. ORANIUS (1964) The 18 ton 37 foot wooden gas screw fishing vessel Oranius was reported missing out of Kodiak in the Good Friday earthquake of March 27, 1964. The survivors were transported to Valdez by the lighthouse tender Columbine. The Oregon, valued at $150,000 and was a total loss along with her cargo. The master was exonerated from all blame. OREGON DAWN (1980) The 98 foot crab fishing vessel Oregon Dawn rolled over on her starboard side and sank February 17, 1980 approximately 2.5 miles south of Cape Tolstoi near Pavlof Bay. Winds were said to be NNW gusting to 75-80 miles an hour. There were 65 crab pots aboard at the time of the disaster. All five crewmembers were rescued by the fishing vessel Patience. OSAMEKIN (1945) The 100 foot 325 ton Navy tug Osamekin (YTB-191) sank in the Gulf of Alaska south of Kodiak Island December 4, 1945. The crewmen of the Oso made it to safety, but the vessel, worth $3,500 and her cargo, worth $800 were both total losses. The master of the vessel knew of no insurance at the time the wreck report was filed. OSPREY (1970) The oil screw Osprey foundered October 17, 1970 in Bluefox Bay, Afognak Island. Lost from the Ounimak were her captain, Thomas Trondson, and crewmen Henry Traiton, August Olsen, Otto Osborn, Mathew Hermanson and Stein Nelson. The vessel and her cargo were total losses. The Ounimak was valued at $4,000 and her 6 ton cargo of groceries, provisions and furs at $600. There was no insurance. OUTLINE (1920) The vessel Outline was lost in 1920 in Cook Inlet. The crew escaped to safety, but the Owl, valued at $3,000 and her ten ton cargo of fish, valued at $315 were both lost.